At DFL Material Handling, we are industry experts when it comes to all things forklifts. Whether you’re looking to hire a truck of your own, or you require testing or a repair, you can trust the team here at Forklift Hire to deliver an affordable, high-quality service every time. We stock a whole range of forklift trucks which are available to hire for your use. Whether you require a small machine for a one-off job or a larger truck for ongoing work, we can help. As well as a range of hire trucks, we stock forklifts which are available for purchase, ideal if you require unlimited use of a forklift within your workplace or industry. To accommodate the needs and budgets of all of our customers, we’ve hand-picked only the very best forklifts to deliver a quality service and price you’ll appreciate. For tighter budgets, our range of second hand and reconditioned models are an ideal blend of value and performance. What’s more, all of our machines are fully-serviced and guaranteed so you’ll always enjoy reliable performance. In addition to our great value and quality service, we take pride in our friendly and reliable workforce. 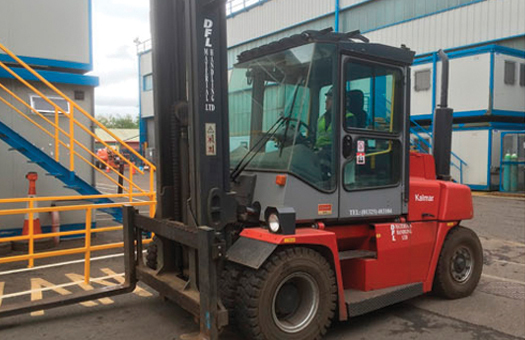 From sales to mechanics, all of the staff at DFL Material Handling have been trained to exacting standards, and can offer you impartial advice on all of our products and services. If you’d like to get in touch with a member of the DFL Material Handling team, then click here to visit our contact page. Alternatively, you can call us on 01325 483 104 or email dflforklifts@gmail.com. We are proud to deliver a range of reliable, high-quality forklift trucks across the North East. For builders, contractors or handymen, our machines are available so that you can deliver a quality and professional service to your end clients.